It’s quite an exciting time for us right now, seeing all our time, labor, and passion finally culminate in this announcement of Lightfield on PS4. It was a very intense time for us — we founded our own indie studio Lost in the Garden, put in a lot of time and effort, learned so many new things, and also made many new friends on the way. There are still exciting times ahead, but for now, let’s take a look back to see what’s behind and how it all came to be. We are a team of four (Julia, Raimund, Matthias, and me) from Vienna, Austria with a background in both art and tech, as well as interactive media and games. It all started three or four years ago when we first got together over a weekend to try out something new. Matthias’ initial inspiration was Slipstream 5000, a classic from 1995, and we wanted to try a new mix of racing and flying with a dash of futurism. The first results were very far from how Lightfield looks and plays now, but we felt that there was already something worth pursuing, or at least enough for us to spend some more weekends on it. The game concept gradually evolved, and at some point early on we introduced the main concept of spinning the ship around and aligning it with the track geometry. The controls were still a bit cumbersome — more flying than racing — but it already was a lot of fun and opened up new and interesting possibilities for us. The concept of a racing game with no predefined roads, no invisible walls or guide rails, was born. Still a weekend project at that time, it became more and more clear to us that this is what we wanted to do. With all the positive feedback we received back then the only way forward was to commit to the project and to start working on it full time. We wanted to turn it into a “real” game, a game that we could see and play on PlayStation. Raimund started developing these fascinating, hyper-futuristic worlds, and the characteristic look of the game. 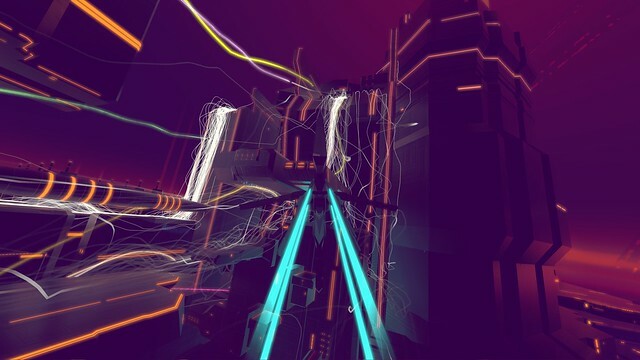 Julia designed the tracks around this impossible and abstract architecture. Matthias put everything together into one coherent game. And I spent quite some time on getting the flying/racing behavior of the ships right. Fast forward two or three years, and this is where we are now: seeing our indie dream slowly becoming a reality. 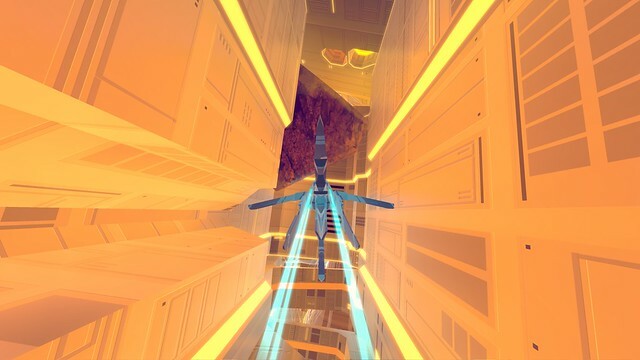 Lightfield became this omnidirectional version of parkour with spaceships where you can attach your ship to any surface, go inverted, and find your own lines through the race tracks and environments. 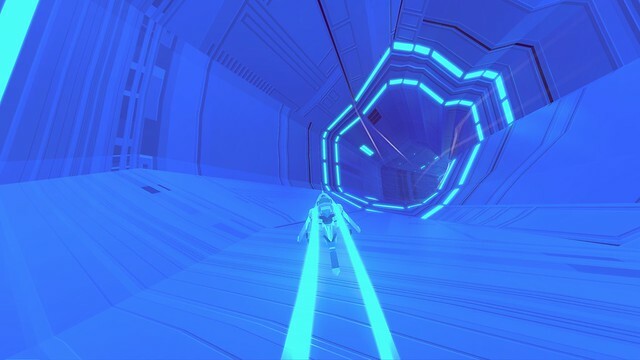 The game features time trial and classic race modes, as well as online and local split-screen multiplayer. It’s an open invitation to explore the worlds beyond the race tracks, to lose oneself in the colorful environments and the driving IDM music by Viennese musician Zanshin.